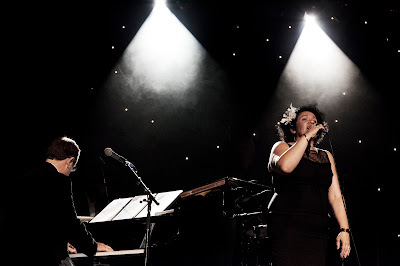 Music News Australia interviews one of Australia's most talented vocalists, Vika Bull. Vika is currently very well known for her role in 'The Etta James Story', currently touring Australia, but as you will learn there's a whole lot more to Vika. How did you get your break in the entertainment industry? I got my break in the business from Peter Luscombe. He was playing drums in The Black Sorrows. They were in the studio recording 'Hold On To Me' and Joe wanted backing singers. Pete told Joe he had heard about these two sisters who were singing in a band in Melbourne. We got called up, auditioned, taken on the road for six weeks and stayed in the band for six years. Growing up, did your vocal talent get recognised at school, or somewhere else, and how did you channel and develop that raw talent? My vocal talent was not recognised at school, I hid the fact I could sing because I wanted to play sport which I did. I only started singing as soon as I left. Mum and Dad always knew I would probably end up being a singer because I was always singing around the house. I joined a band called 'Fear of Flying' when I was 17 and went from there. What excites you most about your current role in 'The Etta James Story'? The singing excites me most about my current role in 'The Etta James Story'. It is a very tough sing, a real challenge and I am really enjoying it. How long will 'Etta' be playing in Australia for? I do not know how long Etta will be playing in Australia for - it depends on the Australian audiences. Is soul your key strength, or is that just what you may be best known for? I think a lot of people might think it is soul and gospel but I think it is rock. What's parts of Australia and the world have your toured? I have toured Australia, UK, Europe, Scandinavia, New Zealand, LA, New York. That's it. How supportive has your sister and family been in your career, and with your current projects? Parents very supportive even though initially they really were not too keen on their daughters being in the music industry. They were just worried about drugs! Linda and I have been singing together for 24 years and it has been great having my sister by my side because sometimes the world was a little scary. They all chip in and look after me when I do the Etta show because I have to sleep most of the day so my voice can recover - they leave food in the kitchen for me, clean my house, they are the best people in the whole wide world. What's been some of the most wonderful and up parts of your life and career, and if your comfortable to share, tougher times, and how you overcame obstacles? Most wonderful part of my life is my daughter. Most wonderful part of my career has been the people I have met and the friendships I have made, I really love musicians. Not too many tough times - most people in this industry have been very kind to me and my sister. Probably my toughest time was when I developed nodules on my vocal chords and could not sing - that was terrible for me. But all is good now thanks to a wonderful surgeon, speech therapist and singing teacher who all nursed me back to vocal health and I think now I am a better singer for it. How do you describe your singing voice, and what's your favourite song you like performing, and why? I would describe my singing voice as probably being a belter. My favourite song I like performing in the Etta show is 'I'd Rather Go Blind' because it is such a sad song about being in love and the person you love loves someone else - grrr! Who have been your favourite couple of performing artists who you have had the pleasure to work alongside side and perform with over the years? My favourite couple of performing artists I have had the pleasure to work alongside and perform with over the years are Paul Kelly, Paul Grabowsky, Archie Roach and David Bridie. What's the biggest (and smallest) audience you have ever performed to? Smallest audience probably 15 people - biggest I think 25,000 at some festival in Europe. What can you tell us that we wouldn't know about other upcoming projects of yours? Next project is a Van Morrison show with Joe Camilleri and Vince Jones - at the moment I am learning songs for that show which is to be performed at the Palais in Melbourne in June. When you have time to relax, what do you like to do? When I relax I like to swim, watch tv and read books about other artists. What would you like to be best remembered for? I liked to be best remembered for being a good mother. What's the best advice you can give to those who are looking to make a career in the entertainment business, and in particular, music and as a vocalist? I don't have any advice - just trust your gut!